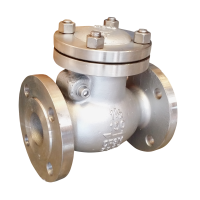 Having difficulties looking for flanged end swing check valves? We can help you because we have all sizes. 150# Flange swing check valve is a valve that allows fluids to flow through it in only one direction. These valves are two-port flange end valves, meaning they have two openings in the body, one for fluid to enter and the other for fluid to leave. Check valves work automatically and do not require any valve handle or stem.